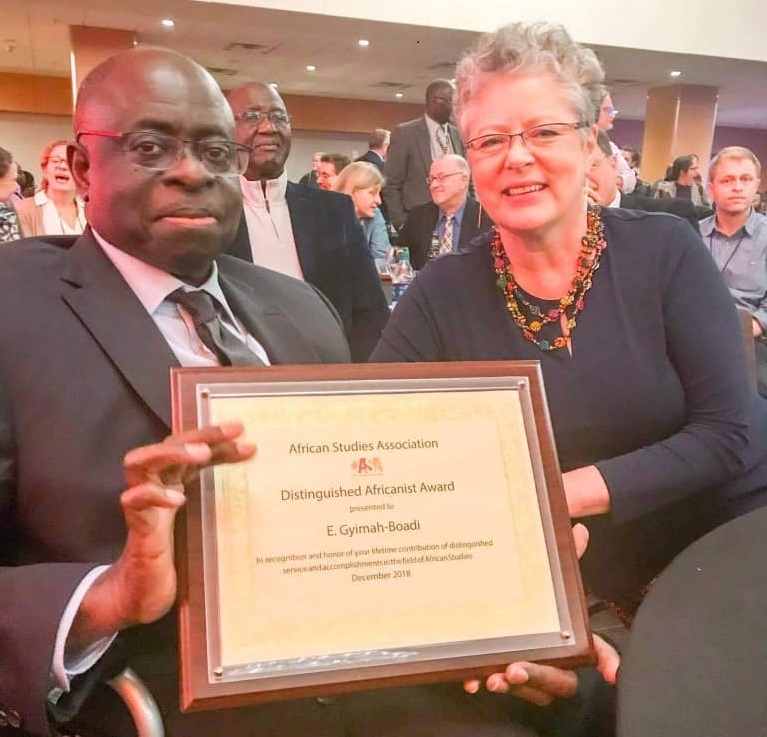 Professor Gyimah-Boadi, co-founder and executive director of Afrobarometer, received the Distinguished Africanist Award from the African Studies Association (ASA) on Dec. 1 in Atlanta The following is his acceptance speech. Thank you, ASA, for doing me this great honor and thereby recognizing the love, sacrifice, and work of many people over many years – because many people have contributed to me being here tonight. Thank you especially to my colleagues and friends who, secretly, put my name up for this award – with what must surely have been exaggerated references. Some of you have confessed to the crime, and others claim there was no collusion. But to all of you, I say a big thank you. I am especially grateful that you did this while the valves of my heart are sufficiently strong to survive this kind of shock. In my heart of hearts, I know I am here today simply because of three factors: right place; right time; right people. The first bit fit of lucky timing came from my decision to move back to Ghana when I did, three decades ago. To move to a country in extremely desperate economic and political conditions is a crazy idea … unless, of course, you’re a newly minted political scientist who is interested in countries in extremely desperate economic and political conditions. Those conditions were not hard to find in Africa in the mid-’80s, including in my own beloved Ghana in 1986 when I decided to move home – shortly after finishing my PhD studies at the University of California, Davis. Back in Ghana at that time, I had something to say for which I had been prepared and which people wanted to hear. From my Ghanaian base, I could write about African/Ghanaian politics from inside the continent rather than outside. I was right in the kitchen feeling the heat, so to speak, and observing, analyzing, and writing on the politics and political economy of the World Bank/IMF’s neo-liberal economic reform programs in Africa. My second bit of good fortune also came in 1986. That was when a certain Brooks Robinson was posted to Ghana for her first official U.S. Foreign Service assignment. This meant my courtship of her would not be disrupted by my decision to return to Ghana from UC-Davis, where we had first met. Her material contribution to our life together saved me from the distraction from scholarly endeavors that many of my colleagues suffered in those years, as they were compelled to moonlight in odd non-academic jobs to supplement their meager university salaries. Her posting to other African countries also gave me the opportunity to visit and live in other African countries that others can only write about from afar. So I was frequently visiting Nigeria when Gen. Babangida was busy gaming the political system to forestall economic and political change. And I was living and teaching in Swaziland when it looked like the monarchy might loosen its grip on the nation (it didn’t) and, even more memorably, while the obnoxious apartheid system was being dismantled and a non-racial democratic order was being installed next door in South Africa. My third piece of good luck was the arrival of Africa’s moment of political liberalization/re-democratization in the late ’80s and early ’90s. This created a far safer political environment for research, analysis, and publications on African politics without fear of government reprisals or self-censorship. It also, eventually, opened the space for initiatives such as the Center for Democratic Development, CDD-Ghana, and Afrobarometer (both of which I had the privilege of co-founding). A few years prior, such actions would have been an invitation for “wahala,” as we call it in parts of West Africa. Consider this: In 1988, as I took my bath ahead of presenting an inter-faculty lecture at the University of Ghana on the politics of Rawlings’ economic reform program, I found it necessary to have my teaching assistant, Kwasi Ofori, stand behind my bathroom window to watch out for potential assailants. Call it paranoia if you like, but a few days later, an official from national security approached the vice chancellor to demand a copy of just that lecture. Somehow we managed to find a way to wiggle out of that request. A decade later, the political environment was sufficiently liberalized for me to help found CDD-Ghana as an independent research and advocacy outlet. And by 2016, Ghana was so free that CDD could conduct and publish the findings of a pre-election poll that said the incumbent president and his party were likely to lose the impending election … and I could take showers without sentinels. The late Professor Kweku Folson, then head of the Political Science Department at Legon, who took me, an undergrad, under his wing, made me his research assistant, and put me on the University of Ghana’s staff development path. The late Professor Donald Rothchild, my lecturer at the University of Ghana, then later my dissertation adviser at the University of California, Davis, and eventually a research and authorial collaborator – as well as a friend. I also count among the most significant influences on my career some of the world’s best Africanist political/social scientists: Naomi Chazan, Larry Diamond, Tom Callaghy, Nicolas van de Walle, Richard Joseph, and Robin Luckham, among others. They have all provided me with invaluable intellectual tutelage and collegiality. In addition to my colleague founding directors of CDD-Ghana, Baffour Agyeman Duah and William Yeboah, I am also deeply grateful for the influence of the esteemed co-founders of Afrobarometer – and the real brains behind the enterprise – Professors Mike Bratton and Robert Mattes, as well as my redoubtable deputy, Dr. Carolyn Logan. And my gratitude goes out daily to my Afrobarometer and CDD-Ghana colleagues, past and present. Typically younger, brilliant, and innovative, their passion and optimism for African/Ghanaian democracy and good governance research and advocacy have helped me sustain mine, even when I thought I had every reason not to. Last but not least, I’ve also had people who have always been there: my beloved wife, Brooks Robinson, and our daughters, Afia and Ama, who have had to endure my frequent absences, but always returned love and support. Such is the formidable social capital that has enabled me to observe and write about aspects of the politics of Africa's economic renewal as well as the post-Cold War/post-communist democratization projects. This combination of lucky timing and great people made possible one of the most significant endeavors of my professional career – Afrobarometer. Through it, we have been able to go into a majority of African countries, sample the opinions of ordinary citizens about their lives, hopes, and fears, and channel those views to policy actors and researchers at the national and international levels. The African state’s continuing capacity weaknesses (even as it faces greater and greater popular political, economic, and social development delivery pressures)? The allure of the Paul Kagame model for the African elite? Growing religiosity among Africa’s technocratic and intellectual class? I am sure that striving to solve these puzzles and make sense of such paradoxes could keep all of us in this room extremely busy for years. But for now, the most pressing items on our agenda is for me to thank you for being here and get out of the way of enjoying this splendid evening.